SC2SEA.com - Starcraft 2 SEA eSports Community Site > Site Portal Forums > Latest News > [SEA News] Team Exile5 welcomes Chan Kim to its professional roster! 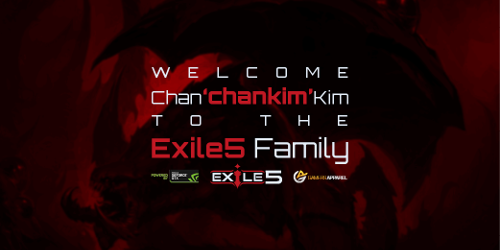 Team Exile5 are happy to announce the addition of Chan 'x5 chankim' Kim to its professional roster. Hot on the heels of recruiting Tileä, x5 discovered another strong zerg player was returning from a break in play. Folks in SEA may know Chan's name from his time spent in eCKo prior to his hiatus, largely as a practice partner, but with the number of team leagues now available we hope to help Chan step into the spotlight and make a name for himself in competitive SC2. Chan will make a very welcome addition to the x5 SC2 lineup. I am very excited to see him play in the upcoming team leagues and hope he settles into the x5 family well. I've known Chan for many years through my clan Ninth Legion and I consider him to be a good friend. When I decided to expand our Starcraft 2 player base beyond the ANZ region, Chan was one of the first people I thought of to recruit to Team Exile5. It goes without saying that he's an amazing player. I don't think it's an exaggeration to say that he's the calibre of player that we could easily see in GSL one day. He's incredibly dedicated to the game and to the swarm!. On a personal level, Chan is quite simply an awesome bloke with a great sense of humour and generally fun to be around. I hope Team Exile5 can help him grow as a professional player. We'll certainly be doing all we can to support him on his journey to Proleague. Can't wait to cheer him on under the x5 banner. To celebrate Chan's arrival on the Exile5 roster, an interview was conducted on behalf of Exile5 and the OSC to let folks get to know him better. With recent picks up of Tilea and Chankim, x5 looks to be a dominant force in the SEA scene again. The team league is gonna be so epic.